Pointing is the action of filling the gap between masonry units (joints) with a mortar to protect the masonry from water ingress and associated decay. Before any work begins it is important to observe how the wall was originally built and take note of this. If you observe traditional solid masonry construction, you will very often note the inclusion of small stones between larger stones. 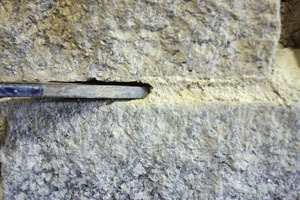 These pinning stones (also referred to as gallets or snecks) may be there to offer support or “chock” or act as large pieces of aggregate, reducing the amount of mortar used within the joint. This reduction in mortar mass aids curing and to some degree the cost. In order to maintain the visual integrity, it is important that these pinning stones are placed back within the wall as close as possible to that of the original. In most repointing cases the least popular aspect of the process, although vital that it’s done as thoroughly as possible is the removal of the existing mortar joints which, in the case of original lime mortars, is relatively straight forward; however, more frequently this involves the removal of hard cement mortars and in order to mitigate further damage to the original masonry this should be removed as carefully as practical leaving as square a profile as can be practically achieved to the back of the joint. Exactly how it’s achieved will be very subjective, as will the tools used to achieve it. There may well be occasions where mechanical cutting out is deemed appropriate and when and where this method is suitable we would advise due diligence to mitigate unnecessary damage to the masonry units. CORRECT: Cutting into open space. When removing existing pointing it’s important to keep any damage to the masonry to an absolute minimum, and themost obvious element to manage that is “common sense”. Remove by cutting out in a controlled manner where the existing is mortar is cut out to the open face of the joint, don’t direct energy from the chisel directly into the mortar. This reduces the energy and stress to the masonry unit. Tools should be appropriate to the joint size and chisels should be as sharp a chisel as possible, while it may be counter intuitive you don’t necessarily require big heavy hammers, and rarely would we advocate the use of mechanical type “breakers” or similar. The joints need to be raked out to a suitable depth, with the general rule being that it should be at least one and a half times the width of the joint, in the case of wide joints common sense should prevail. Insufficient depth will result in nothing more than a token gesture with an increased risk of the mortar becoming loose or simply falling out within a relatively short time. Conversely too much mortar, can lead to masonry becoming looser while benefiting the vendor. Once the joint has been cut out it should then be squared off at the back and further prepared by a thorough brushing out, with no loose material present to compromise the bond of the fresh mortar once it is placed. While this should be important when working with any mortar it’s far more so with lime, to ensure that once the mortar is placed that it’s not allowed to dry out too quickly. To best manage the process, before any mortar is applied the background of the joints will need to be dampened down. As different masonry will have different characteristics the advice we offer here is generic; however, existing lime mortars tend to be highly absorbent and assuming the work is being carried out on typical masonry with an average amount of residual moisture (approx. 20% in northern Europe), spray the wall using appropriate methods that will place sufficient moisture into the background to prevent desiccation of the fresh mortar after placing. NEVER place your mortar into a situation where there is liquid water present. A suitable mortar should be selected for specific application. The table below offers a simple overview of suitable mortars; however, we do advise that you contact us for more specific advice. The mortar for pointing should be workable without being too wet, as a rule the stiffer the mortar the cleaner the work can be executed. 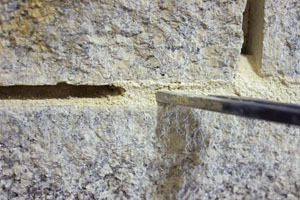 If the mortar is too wet, it can be difficult to apply and will readily stain the masonry; also, the wetter a mortar is the more prone it will be to shrinkage cracking. RST Small Tool Trowel And Square 1/2"
Carbon steel blade with trowel and square 1/2"
There are a wide variety of tools that can be suitable for pointing and for most applications it will come down to what is suitable to the joint size and that of personal preference and what feels comfortable etc. Using too large a tool will result in mortar being smeared over the stone work or prove difficult to apply in tighter joints. A (Plasterer’s) small tool, also known as a leaf & square & trowel & square, can be very useful for where you have smaller joints. In our opinion the churn brush is the most important tool when it comes to pointing with its main role to beat the mortar back after application; this will be discussed in more detail shortly. When filling joints, it is important that the mortar is thoroughly pressed home applying sufficient pressure to the tool forcing mortar into the whole of the joint. When placing the mortar, avoid filling large voids with just mortar, instead think about packing them out with appropriately sized stones that act as aggregate thus reducing the mortar mass which will in turn aid the curing process; regardless of the type of lime used. While there are many ways that pointing can be finished we only advise that of “Fully Flush Pointing” or “Pointing to the Weathered Edge,” where the mortar is finished in such a way that allows water to run down over the face of the stone. We never advocate or recognise recessed pointing where a ledge is created which in turn can allow easier access for water into the masonry fabric from wind driven rain. The best tool and method for finishing is to use the Churn Brush to strike the mortar so as to compact it within the joint in a tamping action, throwing the brush square onto the mortar, in such a manner that you compact the mortar closing up any initial shrinkage that may have occurred, thus improving the contact between mortar and masonry. This action serves several purposes, firstly it improves the contact between the stone and mortar, it also helps clean any material that may be on the edge of the stone and finally it leaves a textured surface. A textured surface increases the surface area of the mortar and allows for greater evaporation from the mortar joint, as it opens the surface. This tamping operation can and should be further repeated at an appropriate time (12 -48 hours) while the mortar is in a suitable state to receive such treatment. The action of finishing the mortar is extremely important for the obvious technical reasons but probably more so because of the visual impact of pointing works; this is after all what you will be displaying for many years to come. As for the right time to carry out this task it should be done when the mortar has reached a state where it has started to set to the point that it’s “leather dry” e.g. when your thumbnail can just indent the mortar; too soon and you’ll simply smear the mortar over the masonry and too late you’ll just wear the brush out quicker. It can be as soon as a couple of hours or as much as 48 hours, or longer during colder weather, especially with lower strength limes. The exact time mortar will take to reach this point will vary considerably on weather conditions at the time (temperature especially), with the mortar taking longer during colder conditions and greatly accelerated during the summer. Therefore with the explanation offered above the best advice we can provide here, is that you should wait for what we hope will be relatively apparent, but please don’t hesitate to contact us for further advice. While dampening the wall is a vital process for pointing, as it helps cure the mortar there are further measures that need to be considered once the mortar has been placed. Weather in the UK is dynamic and while there are several factors to manage the two main concerns to watch out for especially will be frost and drying out. Most importantly, if a lime mortar is allowed to dry out too quickly (rapid moisture loss) the result will likely be a mortar that is chemically deficient and vulnerable to accelerated weathering, and one of the most common causes of mortar failures. Lime mortars demand baby sitting in their infancy with appropriate measures adopted for good curing and appropriate to the prevailing conditions at the time they are placed. This article is to provide general guidance and an overview of pointing, we strongly advise that you contact us for more specific information for individual applications. I cannot find any information regarding mix ratios for lime putty on the website, it would also be helpful if this was included on the packaging, i.e the mature lime putty. Apologies for my delay in reply, our website has recently undergone some changes and i now have access to the comments section. Mix ratios will usually be dependent on the type of work/application you are undertaking. The reason we do not include these on the packaging is that they can vary. The standard mix ratio for putty is 1:3 (1 putty to 3 sand). For further information regarding the mix ratio, please contact us on 01208 79779 and we can talk about your specific requirements. We do not necessarily have a list of approved contractors, as manufacturers its always difficult to do this for numerous reasons. If you would like to give us a call on 01208 79779, we can put you in touch with local companies that have experience working on older buildings. In a few months time I have a job that involves re-pointing and old garden wall to sure it up and make sure it doesn’t collapse over time. The stone work is mostly sound, it just needs re-pointing and a few areas filling in. I have to be honest, in the 15 to 20 years of building and doing stone work, I have never used lime. All the people I have worked for, including my apprenticeship, have never used it. I have done lots of stone work with sand and cement. I have recently gone self employed and after doing lots of research, it seems that it is wrong not to use lime. Any advice you could give would be most gratefully received. Also I am interested in your courses. Do they run all year. Thank you for your comments and to answer your question there is not really a huge difference when it comes to the application of lime mortar compared to cement mortars when it comes to pointing. The mixing is different (mix ratios, no admixtures etc.) and the aftercare/curing requires more as lime pointing needs to be tamped/beaten back with a stiff brush as this action removes excess mortar and sets the mortar into the joint. The curing time of lime is longer than that of cement and if the area/wall is exposed to weathering it needs to be protected sufficiently. With a lime mortar you are looking for a slower cure to prevent the moisture from being released too quickly and limit the chances of shrinkage cracking. The time of the year will also have a significant factor, certain types of lime cannot really be used in colder months due to their weaker nature and slower setting times. To begin we would suggest our articles on Lime in Building, which will run through what is lime and the various types of lime, followed by pointing and curing lime mortars. Also we are available on the phone, by email or in our offices to run through any questions you may have. In regards to the training courses, these usually run on the last Friday of every month (depending on demand) and there are various options available; Introduction to Lime, Lime Rendering/Plastering and Lime Pointing. We do actually have space on our lime training course tomorrow.